No nation on earth has a richer, more colourful, and more long-standing heritage of evangelical awakenings than Scotland - yet most people are unfamiliar with its dramatic legacy. Most historical studies stop at, or before, the Moody and Sankey Revival of 1873-74. It is commonly assumed that very few genuine revivals occurred since that date until the Lewis Revival of 1949-53. Tom Lennie thoroughly debunks this idea - showing that religious awakenings were relatively common in Scotland between these dates - and provides a comprehensive account of the many exciting revivals that have taken place throughout Scotland. ^^The Awakenings in the Outer Hebrides and North East fishing communities, that had several unique and striking features, are considered in separate sections. Revivals amongst both children / students and Pentecostals are also given separate treatment. ^Of particular significance is the first comprehensive account of the 1930's 'Laymen's Revival' in Lewis. This fascinating, but near-forgotten, movement may have been even more powerful and influential than the later Lewis Revival. ^^Glory in the Glen tells a thoroughly absorbing, and largely untold, story. It is the result of painstaking research, conducted over more than half-a-decade, from hundreds of source materials as well as personal interviews. Much of the material has never before been published. 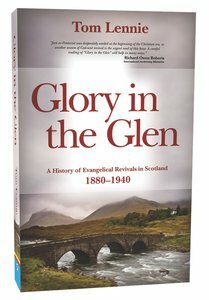 About "Glory in the Glen: A History of Evangelical Awakenings in Scotland 1880-1940"
Customer Reviews For "Glory in the Glen: A History of Evangelical Awakenings in Scotland 1880-1940"
I thoroughly enjoyed reading this book. Having family roots in Scotland and a real desire to learn more about revivals, I found Glory in the Glen a very interesting and informative read. The research that has gone into this book is impressive, well presented and very readable. I would recommend this book to anyone who is interested in learning more about revivals.